The North Carolina GOP is frothing mad after the NCAA yanked their championship games from the state over HB2, the new law requiring transgender people to use the bathroom of the gender listed on their birth certificate. The law also nullified local ordinances that protect gays and lesbians from discrimination. 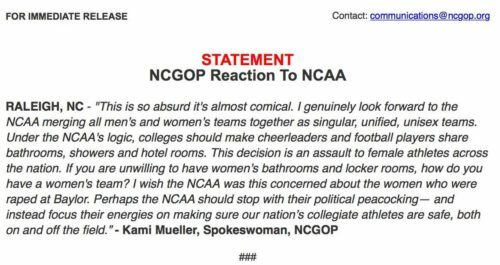 Kami Mueller, the spokesperson for NCGOP, issued the following statement last night after the decision was announced. Obviously, the party is reaching for ways to push back against critics of the law, but surely they can do better than comparing cheerleaders and football players showering together to transgender women peeing in peace in the ladies room. Oh, wait. There is no way to justify discrimination. That’s the problem.